· Government estimates the damage that tropical storm Ondoy (international codename: Ketsana) and typhoon Pepeng (international codename: Parma) at P12 billion. · Ondoy’s damage reached P6.8 billion while Pepeng’s was estimated at P5 billion. · Around 365,884 hectares of farm lands were affected, damaging 559,629 metric tons of palay worth P9.6 billion. From an initial 60,000 has, damaged plantation is now at 106,189 hectares. · Agriculture department will not meet the 3.5% farm output growth target for 2009. · Agriculture output downgraded to 2%-2.5% this year, lower than the 4.68% growth in 2008. 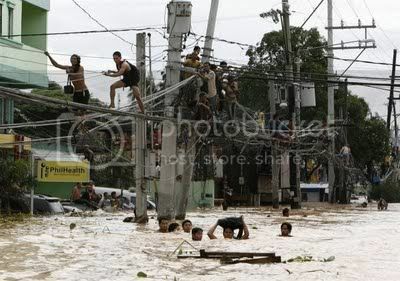 · Finance officials estimate that typhoon damage would trim 0.2% points to Philippine GDP growth. · Philippine central bank said a net inflow of foreign direct investments (FDI) worth $347 million was recorded in July. · This is a reversal from net outflow of $133 million recorded in June. · On a yearly basis, net inflows for the July 2009 were 8.1% more than year ago’s $321 million. · Year-to-date net inflow of $1.2 billion is 33.8% higher than the same level in comparable period last year.